"Bread pudding meets apple pie for a delicious, healthy, and hassle-free dessert. Great option for the leftover bread from last nights meal." 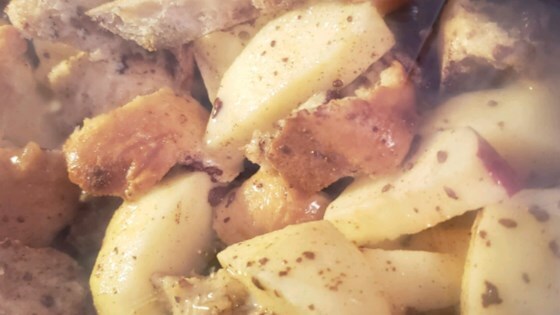 Combine apples and bread in the crock of a slow cooker. Beat eggs together in a bowl. Stir milk, brown sugar, cinnamon, and nutmeg into beaten eggs; pour over apples and bread. Cook on High until custard forms, 3 to 4 hours. Splenda® can be substituted for the brown sugar if desired. Check package for substitution amounts. This was a wonderful recipe, so much better than the plain bread pudding recipes I've tried. I can't say that I would change anything, it was perfect when followed the exact recipe. Not surprised that this was delicious. Great recipe and will make this again. It was okay. Not the best ever. We did eat it, but the younger kids in particular weren't fans. Maybe I overcooked it or something. Other bread puddings I've made in the past have been better. Seemed overly soggy. Followed directions. It had good flavor.